In March of 2013, IDW are publishing a comic I wrote. I would love you to consider picking up a copy. 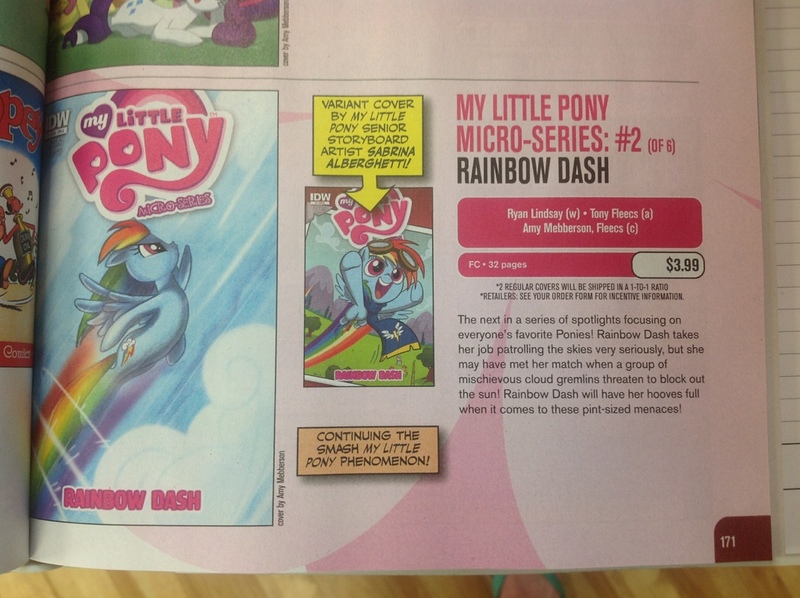 The My Little Pony Micro-Series #2 – Rainbow Dash one-shot is written by me, with art by Tony Fleecs, and edited by Bobby Curnow. There are three covers; one by Amy Mebberson which is a cool, almost chalky number, one by MLP Senior Storyboard artist Sabrina Alberghetti, and also one coming from Tony Fleecs which you will see soon but I have already seen and am deeply in love with. You will need this cover in your life. You can see the ad for the book in Preview below, I took a snap at my LCS. This book is an all ages affair, buuut, if you know your quotes then you’ll see some pretty cool nods to all sorts of subversive fare. Mostly, this book is just fun. I had far too much fun writing it and I hope you all dig it. It would be golden if you would head into your Local Comic Shop and preorder a copy for March. As you know, publishers only print enough copies based on what’s ordered and their orders come from cmoic shops. If everyone waited until the Wednesday it dropped and hoped a copy would be there they would miss out because IDW wouldn’t know they needed to print that many. If you let your LCS know you want a copy, they pass that info on to IDW, and then plenty more get printed and you are ensured on. 3 Covers?? Not on My Little Pony, son! I’m doing 3 by myself. WHAAaaAAT – when was this organised? I am ALL in for this. You have to email me them as they get done, can’t wait to see them.